Throughout researching my novel, it never occurred to me that the chapter that would prove hardest to write and the one which would require the highest amount of historical investigation, was the deceptively simple tale of Duffy's ride on the underground to Aldgate Station. Many people have heard the story of the Lumière Brothers' short film, depicting a train pulling into the station of a small French town named La Ciotat and the public reaction to seeing moving images on a screen for the first time. 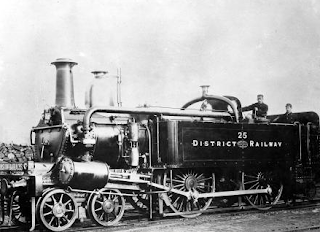 It is said that the audience was so terrified of the vision of a black and white, completely flat train looming towards them, that it caused such panic they ducked beneath their seats or fled from the projection hall. Like most stories that try to suggest that people who lived in the past were a bunch of blithering idiots with no understanding of technical innovation, this story is almost certainly an urban legend, but it is interesting in itself that as early as 1896 when the film was shown, the train was such a familiar sight to the public, it was a suitable enough subject to star in one of the very first films of its age. 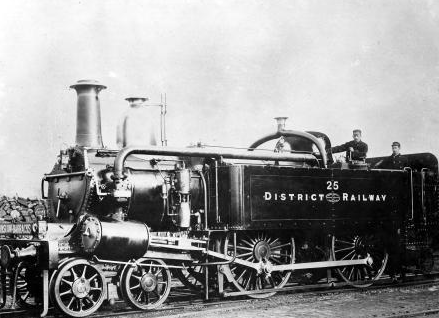 In London, the underground train had been familiar to the average commuter for over thirty years at this time and had been travelling on the surface ever since the early 19th century, but it was towards the second half of the Victorian era that the age of the train really began to advance. The tale of Duffy's journey to Whitechapel proved to be so alarmingly difficult to research owing to the fact that during this time, the underground was expanding to new stops and digging into established stations every year, and the trains themselves were being redesigned with such frequency, that by 1888, it was hard to be sure of just how close to Whitechapel Duffy could ride, and just what sort of vehicle would be transporting him there. The early lines themselves were barely subterranean at all and it's still easy to tell if you are travelling on one of the original Victorian lines because you may occasionally find yourself breaching the surface to daylight. 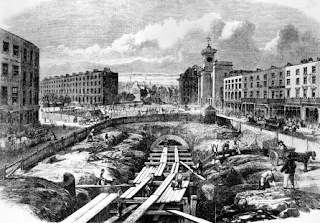 The original line - The Metropolitan was built using a combination of "cut and cover" methods (whereby a trench was opened on the surface and then covered over) and the more common method of gouging into the earth to create a tunnel. Nevertheless, the line was completed in 1863 by which time, anxiety had moved on to the details of riding underground in the dark. To allay such fears every carriage was fitted with gas lighting and was by all accounts, pleasantly illuminated. 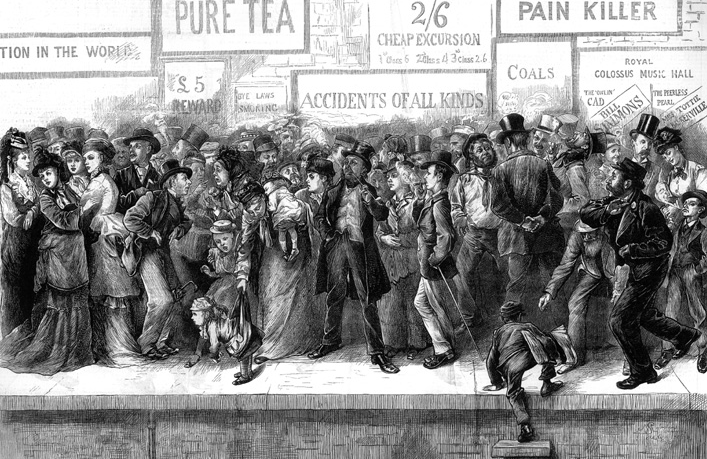 On its first day of operation, an astonishing 40,000 people rode the train from Paddington to Farringdon and by the end of the year, almost ten million journeys had been made upon it. The huge success of the underground meant that expansion was inevitable and almost immediately, work began to connect the Metropolitan line to other stations across London. By 1888, the underground was already being referred to as "The Tube" and was operating as several connecting lines which had extended as far out as Whitechapel and beyond. By the time Duffy takes his journey (where he exits at Algate East, in hopes of not being spotted at Whitechapel station) the initial sheen of novelty had given way to the general grittiness of the average London worker. It became a notorious place for pickpocketing as the confined spaces the carriages provided put the wealthy in far closer contact with the poor than they ordinarily would have chosen. It wasn't long before some lines became the sole providence of the penniless, as the wealthy returned once again to travelling in the far more gentlemanly form of a hansom cab. Another problem with the tube was its inaccuracy. Running on steam meant that there was quite a learning process as far as stopping and starting were concerned. Often a misjudged train would have to skip a station all together if it was travelling too fast and to put the brakes on would cause serious damage. More commonly a train would stop too soon, or too late for the station and the passengers at either end may not be able to work their way out. There was really no great need to include this chapter in my book. It doesn't add any real details to the plot and all we really learn is that Duffy is just as perverted as the last time we saw him. However, my story was to tell a larger story than just that of Whitechapel, but of London itself. A bustling, enormous city in the throes of a massive period of advancement, the likes of which nowhere else on earth had seen before. In some ways, London will always belong in the Victorian age, as so much of that era is the mass development of it into the world's first, great super-city and so much of that change is visible today. In fact, I would go as far to say that London will forever belong to Victoria, but Whitechapel will always be belong to Jack.